Today we went to see the Tate Modern’s exhibition of Paul Klee. It closes on 9 March. If you haven’t seen it, and you enjoy art, I would urge you to go soon. I was surprised how much it moved me. It made me reflect on what art should be. Paul Klee was born in 1879 in Switzerland, but took German citizenship from his father. His career took off when he joined the Bauhaus group in 1920. He was condemned by the Nazis as a degenerate in 1933, refused to cooperate with the Nazi government, and retreated to Switzerland. He died there in 1940 of an incurable wasting disease. The exhibition starts in 1912 and works through Klee’s life chronologically. I am not an artist; I have no artistic training; symbolism usually passes me by. My enjoyment of art is entirely intuitive.The first few rooms didn’t get through to me at all, except some quotations from the artist in the commentary – which bespoke wonderful insight. Then, as it reached his Bauhaus period, it all came alive. From then on, I was entranced. It was at the Bauhaus that Klee started to teach. Perhaps the act of teaching brought clarity to his work. I certainly found the simpler colour compositions more striking (or at least, those with fewer colours!). 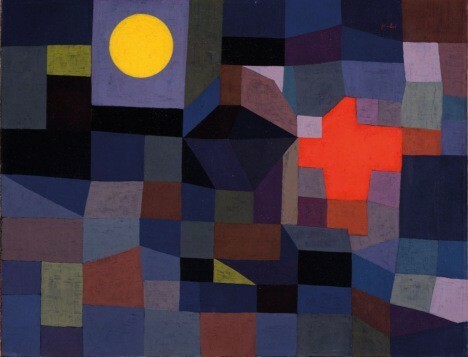 There is an astonishing variety to Klee’s work. It is all painting and drawing; the pictures are quite small; it has a hand crafted appearance. Apart from that, his range was huge. Flicking through the exhibition’s catalogue, I found the reproductions very disappointing. Perhaps his use of colour is so subtle than even modern reproduction technology can’t convey it properly. The right contrasts don’t come through. And he is very textural – which does not come over on a flat reproduction. That’s why it has to be seen in a gallery. Some of my favourites are from private collections – yet another reason I’m very glad I made it. One thing struck me, beyond the beauty and power of the images: the trouble Klee took with the craft itself. He was forever developing new techniques, and he was able to produce a delightful variety of effects. In this era, the artist was seen as a craftsman. That has always been so historically, of course, but I fear we have lost this insight in the post-modern era. Modern artists seem to think that vision and creativity are the thing – and technique secondary, and even a distraction. I hope I’m wrong. My opinion is perhaps unduly influenced by a television series a few years ago, which was a sort of Masterchef for artists. A group of young artists were given a series of challenges, with the overall aim of attracting the interest of the collector Charles Saatchi. One of the early challenges was to draw a model from life. The young artists couldn’t see the point of this, and their results were awful. And they were right: it was most piss-taking of the contestants who won – because she had a creative idea which she was able to realise in a gallery with the use of no technique at all (it was part of a tree impaled on some railings). Have a bright idea; get noticed; you’re made. The rest is a distraction; that seems to be the attitude. What a contrast with the great artists, including modern ones like Paul Klee! Of course none of Klee’s mastery of technique would have meant anything if he had not also had creativity and vision. But you have to be very lucky to be able to realise your insight without a mastery and love of technique and hard work. Or perhaps more strongly, surely all that hard work to render your vision in a work of art develops and deepens the insight. Klee exemplifies that idea.